One of the main reasons given supporting the idea to adopt Western Bulldogs was a little known to the rank and file marketing survey. Evidently those canvassed supported the move away from the name Footscray to Western Bulldogs. The survey even sought and gathered responses from the western suburbs of SYDNEY! This survey appears to be a crucial part of the anti- Footscray campaigners desire to inflict their change on the club. Everyone should understand this, surveys and polls are not a great measuring tool or barometer of widespread opinion. They are often wrong and can be easily manipulated to obtain the answers to questions that the proposers desire. All polls for the 1999 Victorian State election pointed to the Kennett Liberal Government being returned. As we know this did not happen and the ALP opposition won that election. Many polls anticipated that the 2004 federal poll would be close or that the ALP would win. The Labour Party did not win and it also was not close. With manipulating polls and surveys, below is an excellent example of how the desired result can be obtained. This comes from an episode from that brilliant British Comedy (or was it a documentary as well?) 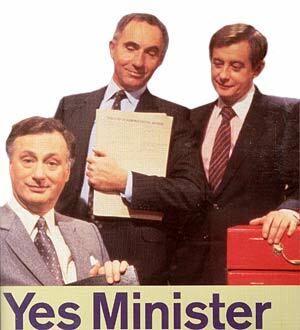 Yes Minister. Sir Humphrey Appleby played by the late Nigel Hawthorne is explaining to Bernard Woolley (Derek Fowlds) the ways and means to get the result you want. He is instructing Bernard on the issue of re-introducing National Service. That example applies to all surveys on any given topic. Similar indeed to the tried and trusted- ‘Never organise an enquiry unless you know what the result will be’. Therefore we need to be given a genuine bona fide vote on this matter, where all the evidence is presented from both camps- the pro-Footscray and the Pro-Western people. A date could be organised in advance giving both sides time to campaign for what they believe and to table their ideals and all facts are figures are there for everyone to see. Democracy has then been served and the supporters can make their own minds up. You are selecting the name, not someone else telling you what it will be. If you think Western is the way forward then you can vote on it and for it. If this legitimate vote is held and the pro-Western side wins, then pro-Footscray people like me would just have to accept it or tolerate it. I would be most annoyed with the outcome of this hypothetical referendum, I would walk around making comments like most election losers do. # Intelligence tests for voting should be a pre-requisite to cast a vote. # It seems the majority of Bulldogs supporters are either stupid, ignorant or both. (1)A vote may go the way of the pro-Footscray people (of which I am assured it would). (2) As this vote hasn’t occurred, I can’t accuse any person or a collective group of being simpletons, because as no-one has ever voted we don’t know whether they are stupid or not. I would at least like to be given the knowledge of having any doubt removed of what the clubs supporters want. The Pro Western Anti Footscray lobby doesn’t want a vote/referendum on this issue or it seems to appear that way. I am yet to meet or hear from a PWAF person that would agree to a vote on the name of the club. This is primarily due to the fact that there are so few of them. How many people who follow the Bulldogs were overjoyed that the name was changed in 1996 and are still rejoicing about that today in 2005? It is only those involved in changing the name (and Optus Oval, Sons of the Scray / West and the Guernsey design) that appear to love the banishment of Footscray and have great satisfaction that Footscray is no more. I often hear people say I wish we were still Footscray but what good will it do changing it back now? Responses to that argument and others can be found in the COUNTERING THE APOLOGISTS chapter. The PWAF people need these apologists/defeatists/mediocrity accepters to bolster their ranks and nullify the real true believers. I would have more time for a PWAF person if they came out and said something along the lines of- ‘Right we want the members to decide on this issue and we are just as keen on a legitimate vote as the Pro –Footscray group. We want to present our case that we are right –Footscray was no good and Western is wonderful. Bring on the vote. Yet it should also be stated that the PWAF mob are not the only ones that believe a vote should not happen. There are many Pro –Footscray people who aren’t interested in a vote either. From that group some will argue- just delete Western Bulldogs now and re- install Footscray, no vote just do it. In exactly the same unceremonious way Footscray was deleted for Western Bulldogs in 1996. I tend to lean towards this viewpoint myself, though for those who would like it done democratically, I would accept that too.